If you need carpet or floor cleaning at your business or in your home in Birmingham AL, you have come to the right place. Heaven’s Best Carpet Cleaning cleans both residential and commercial floors, and we have the best rates in Birmingham. Our services include Carpet Cleaning, Tile & Grout Cleaning, VCT Tile Stripping and Waxing, Hardwood Floor Cleaning, Upholstery Cleaning, Sofa, Couch & Loveseat Cleaning, Scotch guard & Fabric Protection, Minor Carpet Dying & Repair, Spot & Stain Removal, Pet Urine & Odor Removal, Red Dye Removal, Deodorizing & Sanitizing, and Mattress Cleaning. We service all locations in the Birmingham, Alabama metro area including: Hoover, Homewood, Cahaba Heights, Mountain Brook, Vestavia, Chelsea, Center point, Trussville, Leeds, Pelham, Alabaster, Calera, Montevallo, Helena, Westover, Wilsonville and all cities in Jefferson & Shelby County, Alabama. Heaven’s Best is owned and operated by Stephen Mobley, a retired Veteran of the US Marine Corps. Steve spent 18 years in the Corps defending our country and has dedicated his life to the Marine Corps values. These same core values of honesty, integrity, dependability and pride are how he runs his business. He also helps out in the local community. He supports the Salvation Army of Birmingham and volunteers his time to clean floors for them. When you call Heaven’s Best of Birmingham, you will get honest prices, honest expectations, excellent cleaning services, and great customer service. 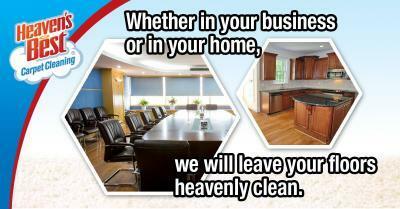 Whether in your business or in your home, Heaven’s Best will leave your floors heavenly clean. Don’t wait any longer; call Heaven’s Best today at (205) 618-9150 for Business or Home Carpet & Floor Cleaning in Birmingham AL. Contact Heaven's Best to schedule a Carpet or Floor Cleaning!